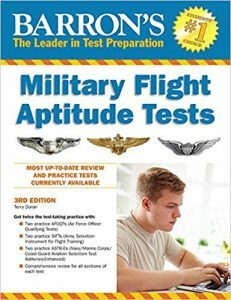 The Air Force Officer Qualifying Test is one of the most important exams taken by prospective students. It makes or breaks their entry into the United States Air Force commissioning programs. The test is similar to most standardized tests like the SAT or the ACT, which you might have given in your high school. However, the content of the test is more comprehensive and requires extensive preparation. It is mandatory to pass this test for all cadets and students on scholarship or in the POC. Since this test means so much, you need to give it your all for succeeding in it. We are going to lend you a helping hand in this journey by directing you towards some of the best studying resources available to ace the AFOQT. Let’s check out in the coming sections. 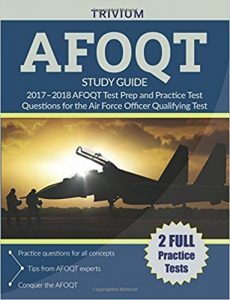 The AFOQT Study Guide 2017-2018 is the latest edition in the AFOQT series by Trivium Test Prep. The publisher is based in the USA and is one of the most reliable ones in the market. Trivium Test Prep ensures that all the content in their guide is up to date with the pattern of the test and actually works on producing content that is focused on the improvement of students, instead of generic information based text blocks. 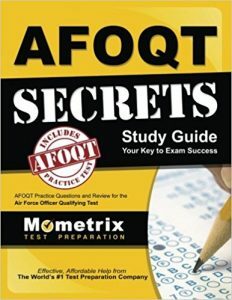 The AFOQT Study Guide 2017-2018 is the latest edition in the AFOQT series by Trivium Test Prep. The publisher is based in the USA and is one of the most reliable ones in the market. Trivium Test Prep ensures that all the content in their guide is up to date with the pattern of the test and actually works on producing content that is focused on the improvement of students, instead of generic information based text blocks. The AFOQT Study Guide by Trivium is one of the best studying resource you can get for the upcoming test. Its quality of content and its price tag also makes it one of the best value for money AFOQT books you can get. The reason why Trivium’s AFOQT guide is so popular is that it helps the students with even the most basic concepts. It also clears out the type of questions that are asked in the exam and leaves no room for doubt when you actually go to the test center. This is made possible because of the comprehensive review of each subject offered in the book, as well as 300 mock test questions for you to practice and improve your skills. The book also provides certain strategies and tricks to back your knowledge with, even if you get stuck with some questions. These tips are a result of years of experience in testing and producing AFOQT studying resources, but you get access to them all in a single go. Once you finish all the 12 sections of the book and go over the practice questions, you can even practice with the 2 AFOQT practice tests at the end of the book, which are based on the actual format and testing level of the exam. While the book is certainly valuable, you should note that there are some editing and proofreading errors in most of the sections that can leave you confused. Always resort to clearing up any doubts you may have about parts of the content, as the publisher may have missed correcting those parts in the editing process. 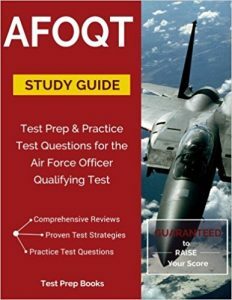 The AFOQT Study Guide: Test Prep & Practice Test Questions quite confidently states ‘Guaranteed to raise your score’ on its front cover. It is one of the popular book for the AFOQT exam and has fully featured content list to cover everything related to the exam. The guide has 222 pages in total, which are divided in to 17 sections, each catering to the development of a different skill set. Each of the 22 sections of the book are comprehensive, but concise at the same time. This will help you learn more instead of wasting your time with fluff content. The sections are complemented with practice questions at the end. The practice questions are strategically planned to test you on all points and if you do not understand any one of them, you can refer to the answer explanations provided for clarifying your doubts. This way, you can learn from your mistakes and avoid making them in the real test. Apart from the practice questions, the sections also provide you with several practical strategies to use in the test, which will allow you to utilize your time better and avoid any silly errors. The tips of the experts will come in useful when you are in a real test environment, with all the stress and tension in the environment. However, for all of its numerous sections and content, the book still feels lacking in materials related to mathematics and sciences. These are fundamental sections and require a comprehensive understanding, which means that if your basics are not good, you would require additional studying materials. AFOQT Exam Secrets Test Prep Team’s AFOQT Study Guide is one of the better options available in the market for a wholesome studying coverage, while still being pocket friendly. This book is divided in to 9 different sections, including basic reasoning, mathematics, science, comprehension, block counting, etc. While the content of the studying topics is nothing special, where this AFOQT Study Guide excels in is its expert designer tests. These tests are prepared exclusively to build your knowledge as you answer the questions and prepare for the actual questions in the exam. The tests aim to clear all concepts and in case you get stuck in any place, there are answer explanations available to assist you in your progress. The publisher confidently states that every student using this book will certainly see a rise in his or her AFOQT scores. While all is good related to this book, what we found is that the designer tests are actually more difficult and at times even a bit different than the actual AFOQT test. This may give the students a false expectation while going to the examination and drop their confidence once they see the exam paper. The AFOQT Study Guide by Accepted Inc. has been written by experienced private tutors, who understand what concepts students require assistance in due to their years of teaching thousands of test takers. They have noticed a pattern of concepts which most commonly cause trouble to the students and have cleared them all in this unique study guide. The book has 172 pages organized in different sections to target specific topics. It comes with 250+ practice questions. All the content in this studying resource has been reviewed by several teachers and hence is finely refined. The focus of the book is to deliver knowledge about all testing topics to the students in an easy to understand, streamlined and concept-driven way. The writers do not believe in loading the students with unnecessary information for the test and hence have eliminated any superfluous content. The book targets mathematical concepts exclusively and if you are weak in your calculations, you will find great help in it. After you learn and understand all the topics, you can practice your concepts with over 250 test questions available in the book. These questions have been carefully planned to raise your confidence as you solve them, making you well settled before the actual exam. The only downside to this book is that it looks to be released in a hurry and there are a handful of editing errors in some sections. Moreover, there are some inaccuracies that have been noticed in the aviation section and require your careful attention in order to avoid memorizing them. Barron is a pioneer in the world of standardized testing, producing best-selling guide books in multiple fields. 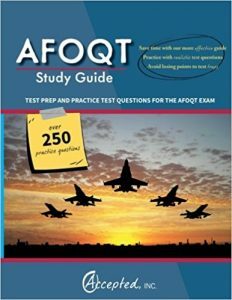 Its Fight Aptitude Test book is an updated prep guide to get you ready for the AFOQT test. It is ideal for prospective officers, aviators and cadets looking to get the coveted pilot status in the air force. The study guide is one of the most affordable one you are going to find, especially considering it is a 650 page book and covers everything about the test in it. You are going to find topic overviews, discussions, actual tests and answer explanations neatly organized to make the book very reading friendly. The Military Flight Aptitude Test includes 2 full practice exams for each officer exam. This study guide by Barron is very comprehensive. It has been written by and formatted under the supervision of a veteran military officer and instructor. This means that the content produced is actually supplemented by the experience of the writer. Each topic, be it language comprehension, math, aeronautic information or sciences, has been thoroughly explained to take you from zero and make you a hero. There are also several strategies discussed alongside each topic of discussion to open your mind and let you think about how to approach a problem from different perspectives. After you go through the whole book and are confident in your skills, you can go ahead and give the 2 full practice exams in the book to buff up your skills before the exam arrives. However, what we dislike about this book is that its content is not updated frequently and you might find some sections which are out of date, in terms of accuracy or test relevancy. Moreover, as with some other standardized test books, this one too contains many editing errors and can be annoying if you are trying to study with a full focus. We have now reached the end of our review for the best AFOQT study guides. All the books and resources mentioned here of high quality and have helped numerous students in preparation of their exam. In order to ensure that the content in the books we mentioned is relevant for the AFOQT exam, we have actually researched all the concepts tested in the previous tests and compared these topics in the books for assurance. All things set, you can go ahead and get any one of these books to start your preparation for one of the crucial examinations in your life. Wish you pass the test with flying colors!